How many times have you discovered several VI properties that needed to be edited in multiple Vis and wished there was a way to quickly and efficiently edit them all at once? ABCDEF introduces a new utility that easily performs that operation. But that is only half of what it does. It is also a powerful project analysis tool. 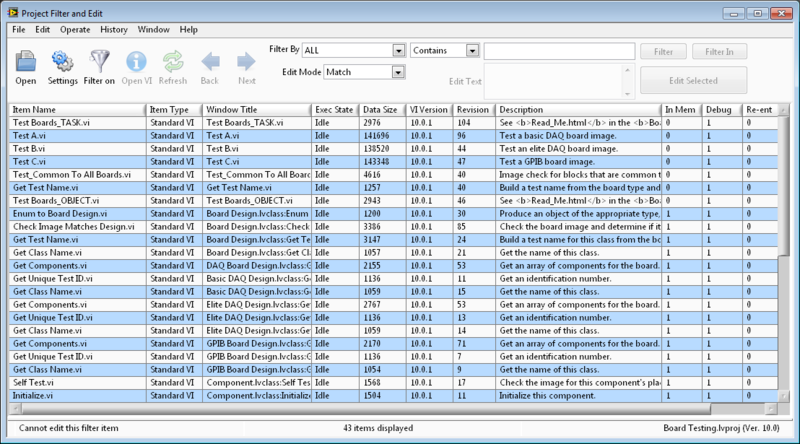 Project Filter and Edit allow all the items in your project to be filtered based on 20 VI properties including VI Description and Allow Debugging. After selecting all or some of the results, many of the specified filtered settings can be modified for all VIs. It is also possible to modify a different property than the filter. This utility is very versatile and configurable. Select only the columns you want to display to search for the properties that most fit your requirements. Enable only the project items relevent to your needs. Filter within the existing result by a different item to narrow the scope. This product is available on the LabVIEW Tools Network. Here are several useful examples of filter and edit operations. The filter and edit settings are expressed exactly as it appears on the screen. Some examples show the edit operation with sample edit text and notes in parenthesis. VI Description Excludes ABCDEF, Append "<CRLF>Written by ABCDEF"
VI Version Less Than "12"